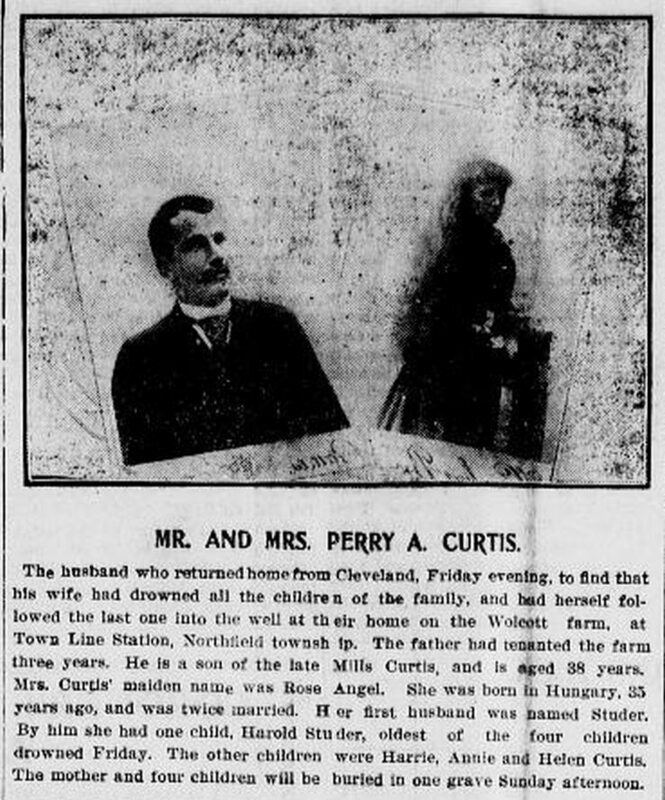 "Drowning…at the Hands of an Insane Mother"
This week I started reading the Coroner’s Inquests from Summit County, Ohio for the late 19th to the early 20th centuries. This has proven to be an extremely interesting collection despite the fact that I will probably never visit the graves of any of the people within its pages. There are hundreds (maybe thousands) of murders, suicides, and weird accidents to read about but one set of entries for an inquest in October 1901 in particular caught my eye. I was hoping there would be more information in the historic newspapers collection about this case and luckily there was. The Curtis family lived on a leased portion of the Wolcott farm near Town Line Station. The family consisted of patriarch Perry Curtis (38), Rose Angel Struder Curtis (35), Harold Struder (9), Harvey (or Harry) Curtis (5) , Annie Curtis (4), and Helen Curtis (2). Rose, a native Hungarian, had passed along her fair hair and blue eyes to most of her children. (The oldest child’s eyes were brown but his hair was also light.) Also living with the family was Florence Kilner, 20, a housekeeper. Harold was Rose’s child from a previous marriage which ended when Mr. Struder died while the child was in infancy. Perry and Rose became acquainted after she was recommended to him as a housekeeper. The widow and Harold had fallen on hard times after Mr. Struder’s death and had been living in the Bethel Mission, so the opportunity to work for Mr. Curtis gave her a way out of shelter life.2 Around 1895 Perry and Rose were married and since the marriage, the three youngest children had been born. On the morning of Friday, September 27,1901 Perry woke up early to transport a load of apples to Cleveland to sell. Before he and Florence left around 3 a.m., the youngest daughter Helen rose in time to give her father a farewell kiss. Rose was also awake and gave both her husband and Florence a kiss, wishing them safe travels.2 Nothing seemed out of the ordinary at that time, although later details would suggest that perhaps Perry shouldn’t have left his wife alone with the children. In hindsight, it may not have been the wisest choice for Mr. Curtis to leave his wife at home unsupervised with the children. It was probably an even worse idea for the hospital to released her as they did. Rose knew that she’d have to return to the insane asylum before November 20 because she was still considered to be of “unsound mind.” When Helen was six months old Rose fell ill with pneumonia and “lost her mind.”1 The specific details of her mental breakdown weren’t outlined in the papers, but she was hospitalized in the asylum after recovering from pneumonia and had been institutionalized ever since, meaning she’d been locked away for well over a year. During that time Helen was sent to stay with her grandmother and Florence was hired in September 1900 to assist with the other children and run the household in Rose’s absence. Even though the mother was in an asylum, she was said to be upset about the separation from her family. Her children had grown fond of Florence and accepted her as a type of mother figure, which probably greatly disturbed Mrs. Curtis. Her behavior during the two weeks that she had been home wasn’t unusual. She seemed to get along well with everyone and was enjoying her freedom from the hospital. During that time her mind could have been plagued by the fear of being replaced by a younger woman in the hearts of her children and husband. Did the notion of being separated from her family again madden her to the point of murdering them and then taking her own life? 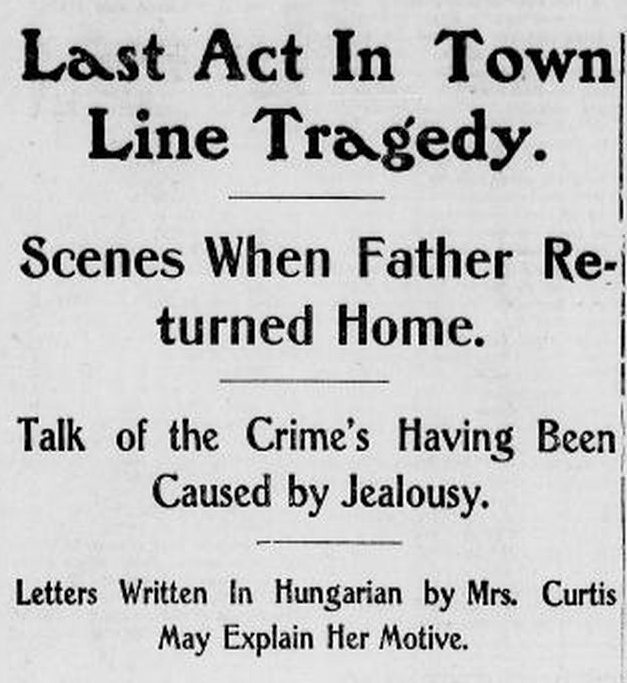 Mr. Curtis said Rose had been writing to her sister in New York, but all of the letters were in Hungarian so he was unable to read them. The last mention of the letters was that Mr. Curtis was going to have them translated. I found no mention after that of a written explanation as to why Rose chose to kill her children and herself, so that part remains a mystery. After the tragedy various theories about what happened circulated through the town. A detective named James Burlison speculated that Rose had killed the youngest child by hitting them in the face with an axe before dumping him into the well. An axe was recovered from the bottom of the well and Burlison said that because there was very little water in the child’s lungs he must have been unconscious or dead before he reached the water. Another rumor was that Rose and the children were all murdered, but the prevailing belief was that she had acted alone that morning.